As much as this is not enough to live off of, I’m looking on the bright side in that my income in November was more than 6 times what it was in October. Baby steps, right? It’s definitely not the most I’ve ever made, but like I mentioned before I’m working on some other income streams because right now my main source of income is design work which fluctuates like crazy and is pretty slow around the holidays. I did throw out a deal for friends and family to design holiday cards. A few showed interest, but in November I only got one order. I’m thinking I’ll get one or two last minute orders. I also reactivated my Fiverr gigs. It’s not exactly going to pay the bills, but they are quick little ways to make a few bucks without a ton of revisions and editing so it’s a nice boost. The Printing and Shipping category is a bit higher than it should be. Unfortunately, my printer ended up making a mistake (slightly my fault too) so, while they credited me the amount on the cards I ordered, I ended up paying overnight shipping to make my client happy. Oh well. Small profit and happy client is still a win. I got a sweet Black Friday deal on hosting through A Small Orange, a company I had been wanting to switch to from Hostgator anyway. So the monthly fee for Hostgator will be gone next month as long as I get cracking on transferring everything over. The $12.50 I spent on A Small Orange is for an entire year and included a free domain registration for a year. I told you it was a sweet deal! I’m a little disappointed that my page views and traffic has gone down a little bit for this blog, but I haven’t been posting as much so I almost expected it. Since I’ve been working on improving the function of my blog as well as my social media strategy, I’ve taken a break from creating much content as I re-evaluate and figure out how much I really want to post. Fewer, better quality, posts is where it’s at so that’s what I’ll focus on after I finish tweaking and enhancing my current posts. On the other hand, Miss Tightwad has been getting some more pageviews without me posting much. It’s kind of on the back burner as well while I try to do some maintenance and optimizing throughout my blogs. First let me note that this section is full of fails. But as I kind of changed my direction and had a lot of successes in other areas in November I’m not too worried about it. I’ve been hard at work organizing and enhancing my blog content as well as working with new social media strategies. I’ll definitely be sharing my experiences in the next few months. Increase traffic to 7,000 pageviews | FAIL. I was nowhere near this. Social Media Marketing Plan | HALF FAIL. I don’t have a plan, per say, but I have been implementing some new strategies. I just need to polish them up and make an actual plan. Make at least $300 in November | FAIL. Bring down expenses to $150 | FAIL. I spent way more than that. However, if you take out the Teachable bundle I bought it’s pretty close. How to Blog Post | FAIL. There are so many out there, I really want to be able to write this post in a way that is unique, helpful and clear. I’m going to hold off on this for a while. Finish Removing Irrelevant Posts | Since my focus for this blog will be on entrepreneurship, blogging, business, productivity and the like I wanted to remove any blog posts that aren’t relevant. But at the same time I have years and years of lifestyle blog posts so I’ve moved them to a new home where I’ll continue updating with lifestyle posts, but it won’t interfere with the focus of this blog. If you read my 5 Ways to Make Your Existing Content Work for You post, you’ll notice that removing “bad” posts was one of the things I recommended. Finish Enhancing Existing Content | In addition to removing tons and tons of posts, I want to make the posts that get to stick around much better. Epic even. That includes adding more detail, adding content upgrades, basically anything I can do to make that content even better. Reader Survey | In planning for 2016 I want to get your insights and opinions. Keep an eye out for this in the coming weeks. I promise to keep it relatively short, but it would make my day if you would participate. I want to make sure I’m posting helping, relevant content that helps you! Ecourse Planning | With 2016 coming up I have plans for at least a couple of ecourses on topics I have a ton of experience with. I have several ecourses in mind and want to work through them to see which I want to offer first and get to outlining. The goal is to launch it no later than February! How was November for your blog or business? I love reading posts like these! Thanks for sharing. Thanks for the comment! 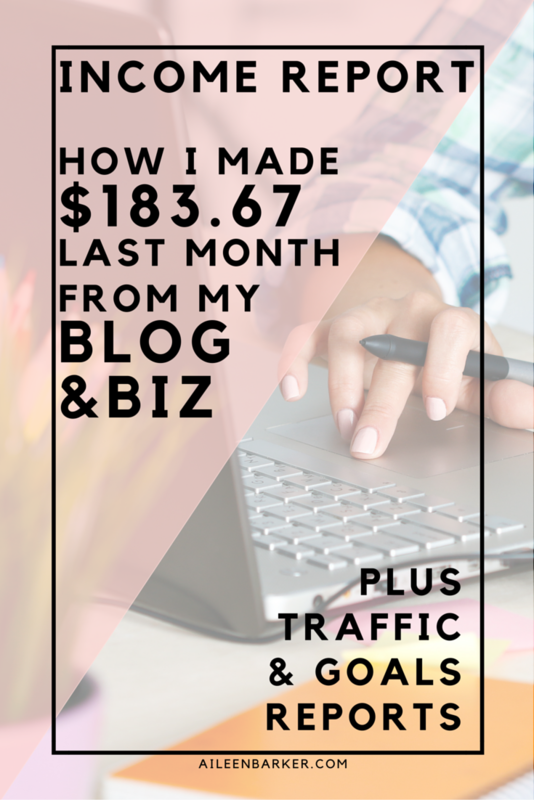 One of the reasons I wanted to start now was to show that not all bloggers make thousands.